Volume Shadown Copy (VSS or Shadow Copy for Shared Folders prior to Windows Vista such as Windows XP) or more commonly known as Previous Versions which used as the name for right click context menu command and for one of the tab for files and folders properties, is a useful feature that automatically or manually backup copies or snapshots of files or folders on a specific volume or drive at a specific point in time incrementally so that users can quickly and easily restore or recover (or go back to) the older versions of files or folders in future when needed. When will you need to use Previous Versions? On time such as accidental file deletion or modification of documents and files. Unfortunately, Microsoft decides to support Previous Versions feature only in more premium versions of Windows operating systems. For example, Previous Versions only exists in the Ultimate, Business, and Enterprise editions of Windows 7 and Windows Vista, and Professional editions of Windows 8, Windows 8.1 and Windows 10, while Windows Vista and Windows 7 Home Basic and Home Premium editions, and Windows 8, Windows 8.1 and Windows 10 Home editions are left out in the cold, probably to encourage sales and upgrade to Ultimate edition. However, the baffling point is that the Shadow Copy Service (VSS, also known as Volume Snapshot Service) is actually included in those editions of Windows that Previous Versions is not supported, up and running by default. The Shadow Copy Service is used by both Previous Versions feature and Windows’s backup utility, System Restore, which enabled in all editions of Windows. The worst part is, although Previous Versions feature in not enabled in those cheaper home versions of Windows, but the snapshot backup of Shadow Copy actually includes all files including user data files, which is not necessary for System Restore function. This behavior eats up plenty of hard disk space and system resources, yet users cannot access the backups of these user data files in the event they need it most. It looks like Microsoft simply remove the graphical user interface (GUI) of Previous Versions that allows users to recover restore lost or changed or altered files in less premium editions of Windows, with all other background process running intact. This arrangement of saving and keeping backups of user files but hide the user backups probably is to ‘please’ users who decide to upgrade to premium or professional edition using Windows Anytime Upgrade, where changes to older versions of user data files prior to upgrade can still be found. It can be also that programmers and developers of Windows too lazy to ‘fine tune’ VSS to exclude users data files from backup. Thus, to access the Previous Versions or Shadow Copy backup of user data files, users have the option to upgrade to professional version of Windows, which is expensive. In this case, ShadowExplorer can come in handy. From security point of view, it’s best to turn off Shadow Copy (include both System Restore or Previous Versions) if you’re not actually using it, since you’re not aware that copies of files have been saved as backup, nor can see, view, use, access, remove or delete them without advanced technical skill. 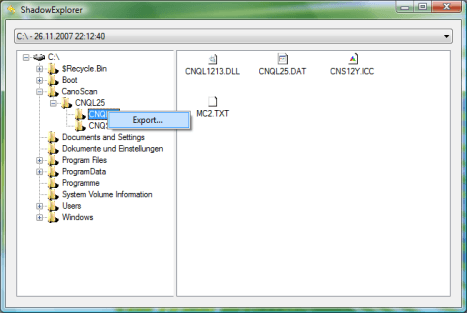 ShadowExplorer takes advantage of the Windows Volume Shadow Copy service and the backup snapshot copies that created by it to allow users to browse the shadow copies. ShadowExplorer can access the shadow storage, which often off-limit to novice users due to complex permissions and rights issues, and make the point-in-time copies accessible to the users. Thus, ShadowExplorer is especially useful for home users who do not have Previous Versions feature, but need to recover or get back earlier version of accidentally edited documents, or retrieve lost deleted files. Shadow Explorer can retrieve all versions of files and folders saved by VSS. Unfortunately, users will need to run ShadowExplorer as administrator to access Shadow Copies and recover old files. It’s a little inconvenient than the contextual based Previous Versions built in professional, business and enterprise editions of Windows. But it’s better than no access and no hope at all.